Thanks to Sister McBrewin’ being willing to stand in line on Thursday while I was stuck in class giving a presentation, we managed to score two tickets for Belmont Station’s Russian River IPA tasting event. * This was a part of their three-day-long 14th anniversary celebration. There were only a hundred available, and they sold out in fifteen minutes. Why did they go so quickly, you ask? Because this IPA flight included Blind Pig, Pliny the Elder, and Pliny the Younger. *Side note: this little bottle shop with its small ‘bier cafe’ attached is probably the best place in Portland to find elusive, sought after beers. Sister and I got over to the Station late this afternoon, and proudly turned in our tickets in exchange for our flight of 4 oz tasters of three of the highest rated IPAs out there. 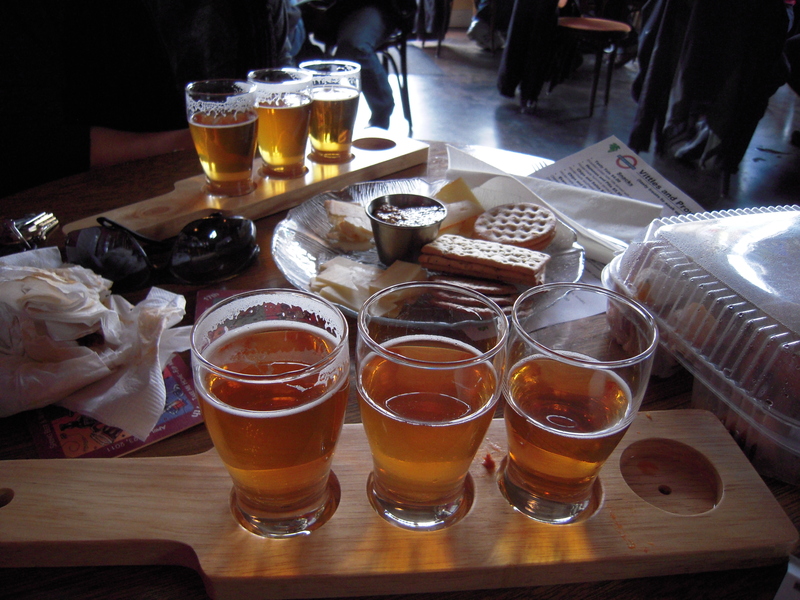 We ordered an artisan cheese and cracker plate so as to have a palate cleanser on hand, and tried not to look too eager to dive into one of the most sought after beers in the country. I should say that in isolation, Blind Pig is a great beer. And, of course, Pliny the Elder is consistently held up as one of the best Imperial IPAs in the world. I wouldn’t have believed there was a beer out there that could make PTE’s hop profile seem tame. But climbing back down the flight from the Younger proved that it can indeed be done. TASTE: Having talked to a few folks who were already into their samplers before I got to mine, I was afraid that there was no way this beer could possibly balance the gargantuan hop presence with sufficient malt sweetness without making the final product cloying. Fortunately, my fears turned out to be unfounded. This beer is the apotheosis of a West Coast Imperial IPA. The grapefruit hits you immediately, followed by an incredibly complex melange of hops (some of which actually seemed to contribute a little sweetness of their own), with then what I can only describe as a warm malt richness coming to the fore, and a moderate alcohol burn on the finish to wrap up the experience. It wasn’t over-sweet at all, but there was certainly plenty of malt in there to balance the hops. The combination was so perfectly melded that I don’t think my vocabulary is up to the challenge of describing it appropriately (I should have called in Mashtun for assistance). DRINKABILITY: There is absolutely nothing sessionable about this beer. I would love to have had a full pint to get around, but between its high ABV and a level of hoppiness like I’ve never encountered, one would certainly be enough. RATING: Honestly, I wanted to be a cool hip beer snob and say that this beer is over-rated due to its rarity and doesn’t deserve its reputation as one of the best beers in the US. But that’s just not how this played out. 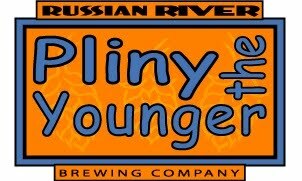 Pliny the Younger is a big, beautiful, brilliant Imperial IPA (or Triple IPA, or Double Imperial IPA), and is as well crafted as any beer I’ve ever had. If you can find an opportunity to sample this gem, jump on it. It gets a full four hops, and then some. On a final note, some of you faithful readers may remember the minor debacle I experienced when, as a less educated Alehead than I’ve since become*, I put forward Pliny the Younger as the best beer to pair with barbecue. I didn’t realize at the time that it wasn’t bottled, and was only available in an extremely limited release once a year (nor had I ever had it). Brother Barley suggested at that time that not only wouldn’t any of the Aleheads ever have PTY, but that one would never have the opportunity to pair it with barbecue. And so I give you, for perhaps the first time in history, photographic evidence of a guy with a Pliny the Younger in one hand and a hickory smoked barbecue brisket sandwich (from Clay’s Smokehouse Grill) in the other. And you know what? It was absolutely freaking delicious. Posted in Tasting Notes.Tagged 4 Hops, Belmont Station, Pliny the Younger, Russian River. Well played Beerford, you are absolved of your sins. Sorry I couldn’t be equally dumbfounded alongside you. Nice get Beerford- although 4 ounces of Pliny might result in the Alehead equivalent of blue balls… still, certainly better than nothing. If you’re going to use a picture of an anonymous stranger, why pick one with that ridiculous facial hair? 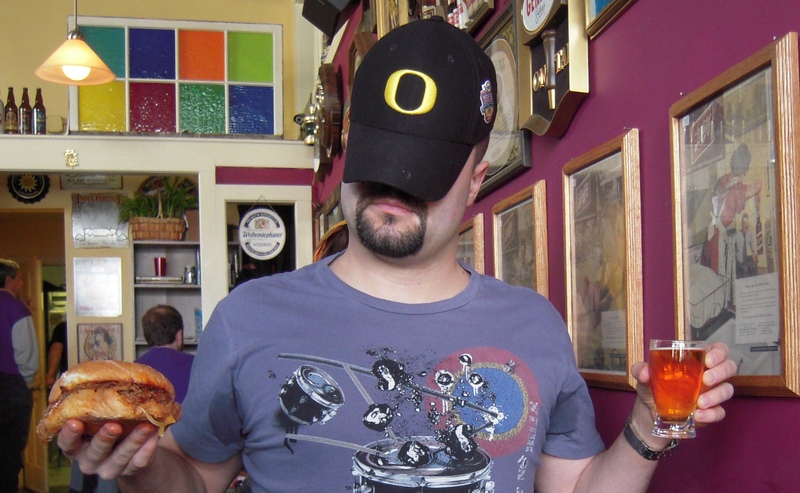 I would almost rather show my face than that ridiculous Oregon hat…Eh, that’s just the bitterness talking. I haven’t felt this jealous since Benny threw on his P.F. Flyers to pickle The Beast. UFOJE, this might almost even out our respective jealousies relative to that whole pesky football national championship thing.